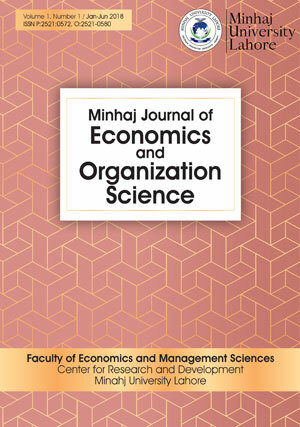 M inhaj Journal of Economics and Organization Science (MJEOS) is a bi annually open access double blind peer-reviewed medium for the publication of research papers of interest to researchers in economics, business management, commerce, finance and public administration. MJEOS is sponsored by Faculty of Economics and Management Sciences (FEMS) of the Minhaj University Lahore and published by Centre for Research and Development. The journal is designed to welcome research papers of a quality and context that the Editorial Board of the Journal think that it would be of interest to an international readership. In fact, the aims and scope of the MJEOS are to provide a venue that reports research on topics that are of international significance. The MJEOS is interdisciplinary and like to promote original empirical and theoretical research papers including, but not limited to case studies, surveys, discussions of conceptual issues and book reviews. All manuscripts received for publication are double blind refereed by Editorial Board members and ad hoc reviewers in the appropriate discipline. "MJEOS is keen to provide a platform for sharing views and insights scientifically, for the sake of knowledge creation relating to economics, business, management, finance, trade and commerce which will help enhancement of capability and productivity for decision making. MJEOS pay highly gratitude to researchers, policy makers, academicians, economists, authors and other interested professionals for providing inputs for MJEOS". MJEOS acknowledges and pays gratitude to the unforgettable contribution of Prof. Dr. Zulifqar Ali Khan, as a great academician of Pakistan. He served as Dean, Faculty of Economics and Management Sciences, Minhaj University Lahore. He also gave valuable additions in the publication of this journal. May Allah shower His countless blessings on him and rest him in peace.